Mario (Adrià Collado) and Clara (Macarena Gómez) are in a bind. If they do not secure an apartment within fifteen days, they will have no place to live. But Mario has good news. In his hand is an ad for an apartment that claims to be spacious, affordable, and located in the suburbs. It sounds just like what they are looking for so they meet with an eager realtor (Nuria González). However, when they get there, the place seems to be located in a dangerous area and though the inside offers a lot of room, it is dingy, dirty, and requires a lot of work. Mario and Clara wish to leave but the real estate agent does not let them. “Para entrar a vivir” is a fifteen- to twenty-minute short film, at best, stretched into seventy minutes of bad survival skills and a whole lot of unpleasant screaming. While the premise has some potential given that the apartment complex functions as a sort of house of horrors, there is not enough meat and juice to make it a satisfying experience. The screenplay by Jaume Balagueró and Alberto Marini does not give the characters a chance to be remotely likable by allowing them to behave like normal people responding to a life-threatening situation. What always bothers me is when a character has the body size and frame to match and perhaps overpower her assailant—in here, the villainous realtor is frail-looking—and yet she either stands around waiting for a bad situation to turn worse or when she does decide to fight back it appears as though she has never seen a horror movie. Is Clara being a couple of days pregnant supposed to be an excuse for her idiocy? I don’t think so. On the contrary, she should be written smarter, hungrier to survive because the little guy or gal inside her is worth fighting for. The formula of a chase followed by an act of violence and then another chase gets tired fast. Because it is unable to break from this pattern, the picture becomes a predictable bore. The camerawork does not help the situation. 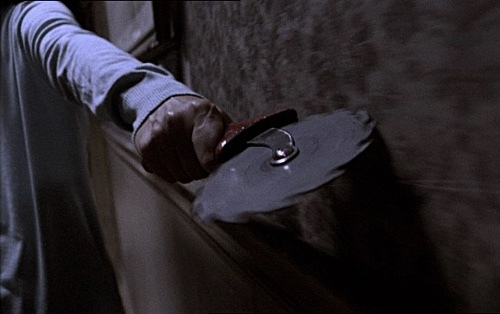 When a chase dies down and the booming score is on the verge of disappearing, the camera remains to shake left and right. It is uncomfortable to watch especially when it goes in for a closeup of a terrified victim’s face. The point is to get us to feel safe again before that inevitable “Gotcha!” moment. It is impossible to get to that point with the camera wobbling about. We know absolutely nothing about the couple being chased around the building. Clara got on my nerves. She is whiny in the car on the way to the appointment. She is whiny (and disrespectful) when they are getting a tour of the place. And she is whiny when there seems to have no escape route. You’d think she’d change her strategy because her whinging gets her nowhere. It is not the actor’s fault. She is not given anything to work with. Maybe if we were provided background knowledge of Clara being privileged, snooty, and everything always going her way along with her boyfriend endorsing such behavior, perhaps the constant whining would make sense. “To Let,” directed by Jaume Balagueró, lacks creativity, technical understanding on how to structure and execute good scares, as well as characters worth championing to make it to the end. And with such a deliberately ugly ending, it only supports that the writers could not care less about the people suffering on screen.